After a nearly two-year hiatus to “recharge”, “refuel” and “refresh” her decade-long quest to bring green content into the mainstream media, eco-pioneer Betsy Rosenberg is back with a new call-in radio talk show. 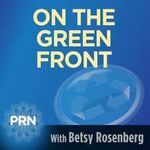 On the Green Front with Betsy Rosenberg airs on Voice America’s Green Talk Network every Thursday, at 1:00 p.m. pacific and 4pm east. Click here. The program is archived on this blog and will soon be available with downloadable podcasts on demand from itunes. Betsy Rosenberg is an award-winning news reporter, anchor, green radio host and environmental advocate. A 25-year broadcast veteran, Betsy's groundbreaking program, EcoTalk on AirAmerica, was the first green show in the country to air daily, focusing exclusively on environmental issues from the science of climate change, to peak oil, to endangered oceans and species, waste, fuel efficiency and beyond. Her focus has always been on how these challenges impact humans and how we must all become the solution if we’re to survive, and thrive, on this planet. She has interviewed nearly everyone in the green forefront, from Al Gore to Robert Kennedy Jr. and so many others - including Van Jones, Bill McKibben, Gov. Brian Schweitzer, Dr. Jim Hansen and Richard Louv - only now attracting attention from mainstream media. Betsy has also been a keynote speaker, featured presenter, panelist and moderator at many green conferences around the nation and has been a regular guest on local and national television shows including CNN Headline News and Fox's "Hannity and Colmes." Betsy was also years ahead of the curve with her gas-roots campaign, Don’t Be Fueled! a national campaign aimed at increasing supply and demand for more fuel efficient vehicles. In addition to producing Green-To-Go radio features (quick tips, lasting impact! ), Betsy is a graduate of The Climate Project, Al Gore’s training program designed to better educate the public about climate change. In addition to being a wife, mother, and volunteer with the Marin-based EcoMoms Alliance, Betsy travels and speaks across the country to help raise America’s Eco-IQ by connecting the dots with her unique ability to inform, humor, and inspire. Sustainable Life Media, Clorox’s Green Works and Mighty Leaf Tea. Betsy will also be partnering with Rob Wheeler of the Citizens Network for Sustainable Development, which was recently voted one of the Top Ten Projects on Change.org and communications specialist and author John Marshal Roberts, author of Igniting Inspiration, a persuasion manual for visionaries. Betsy looks forward to seeing and hearing you On the Green Front on Voice America!